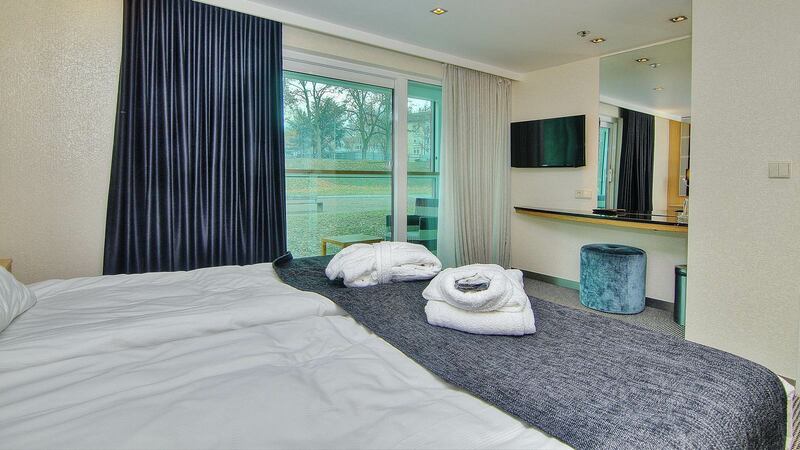 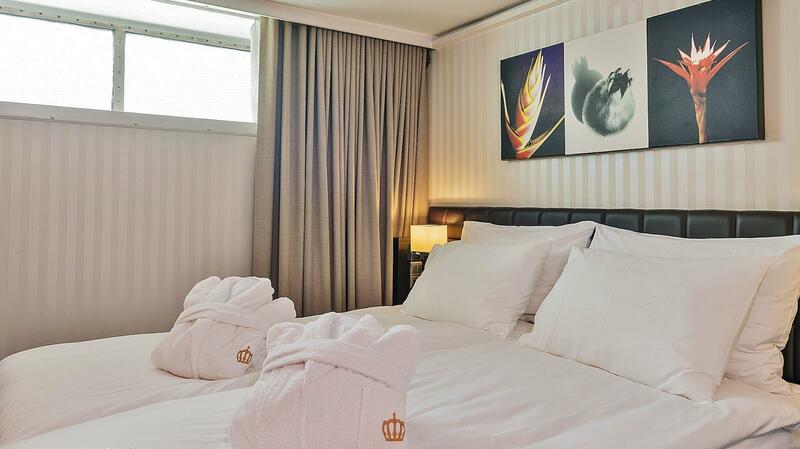 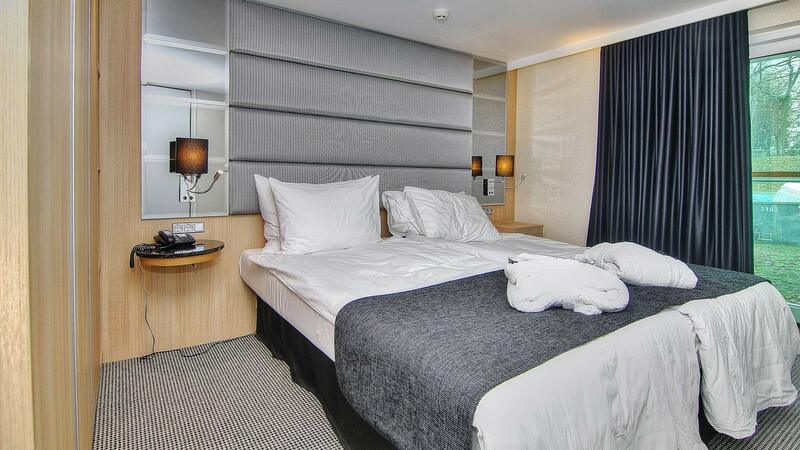 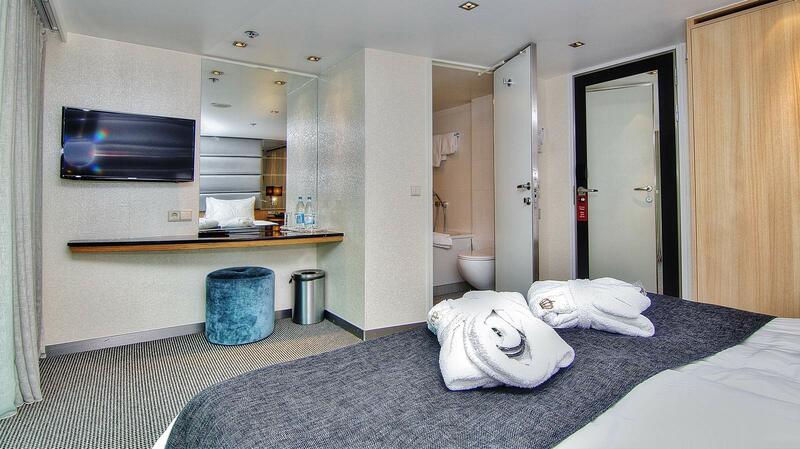 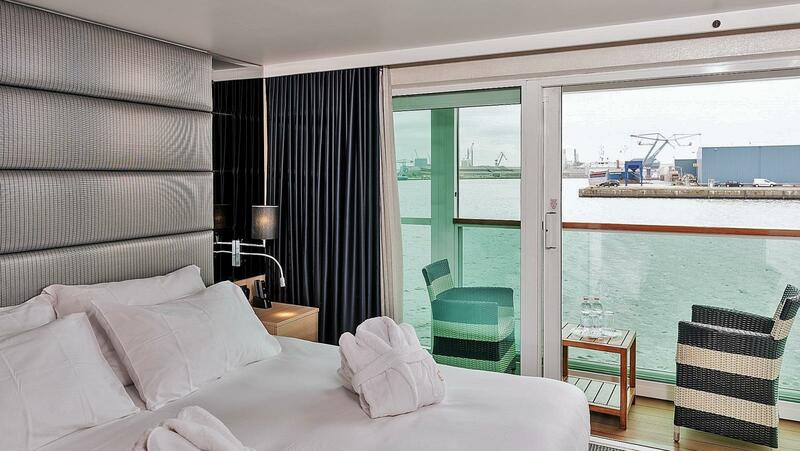 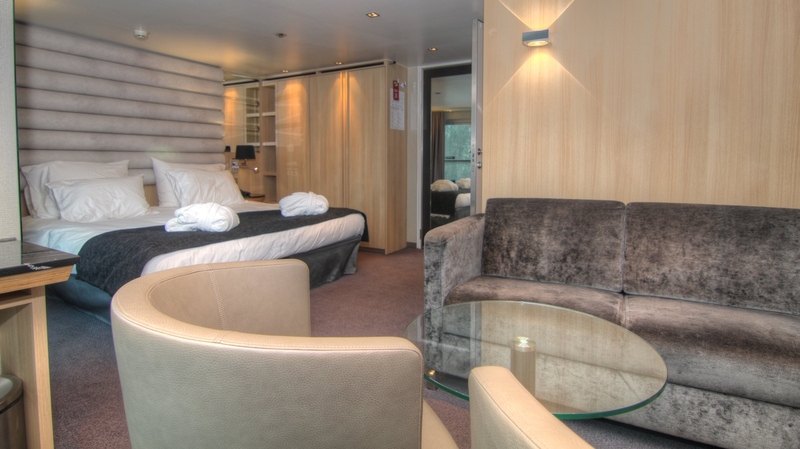 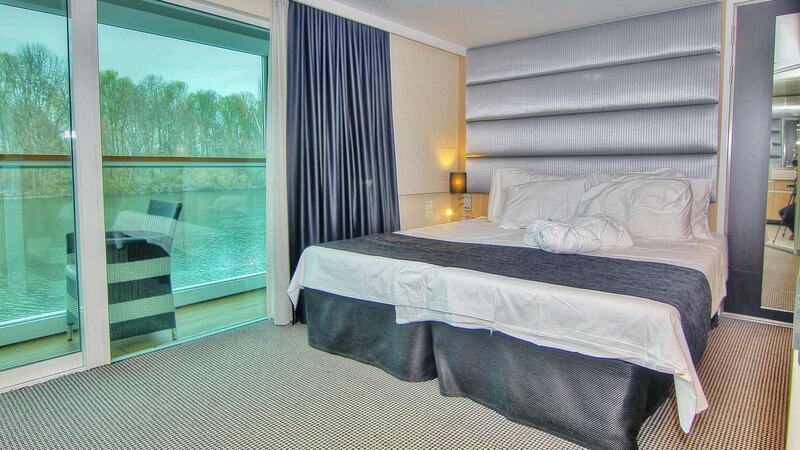 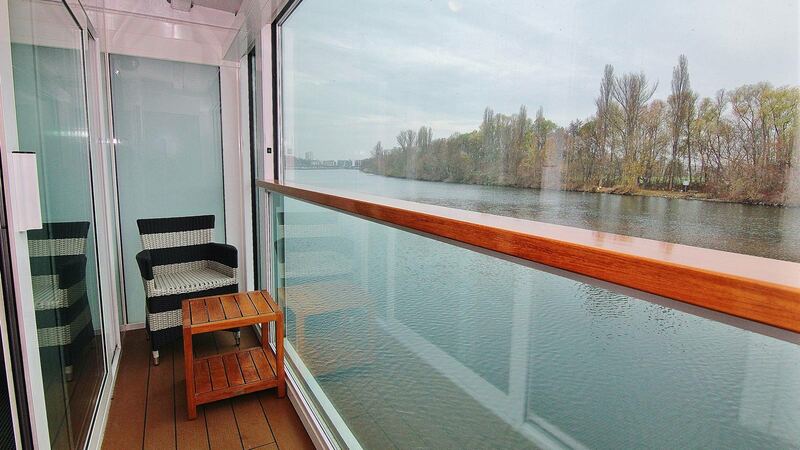 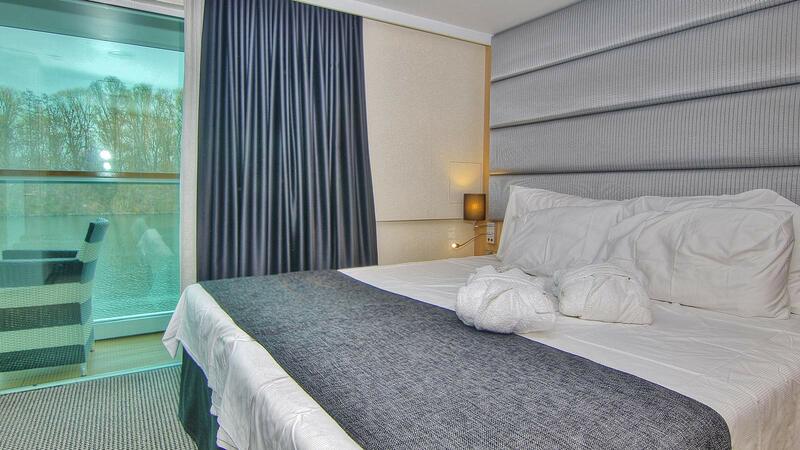 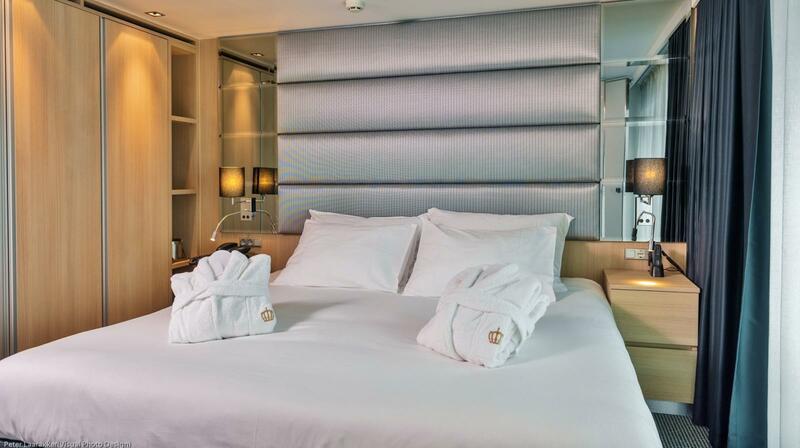 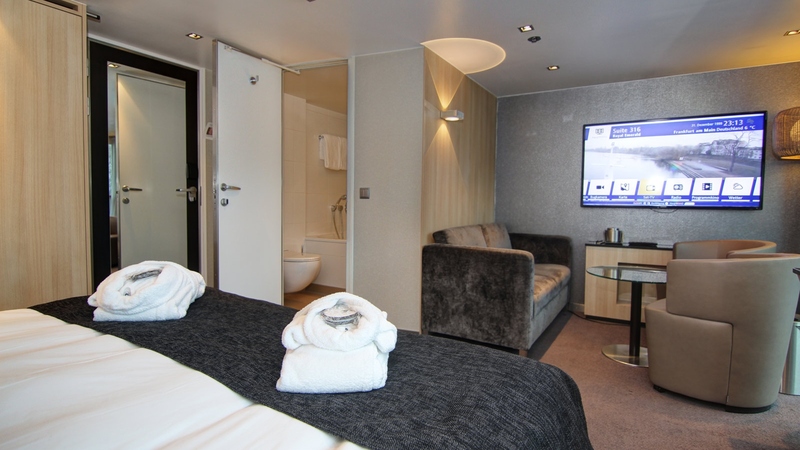 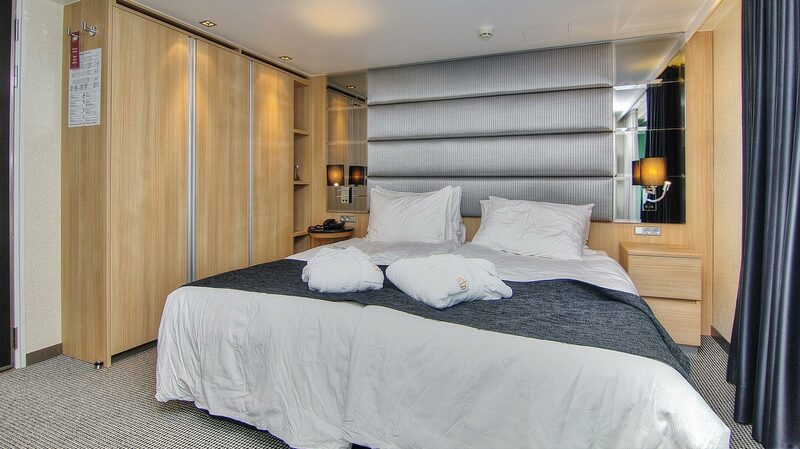 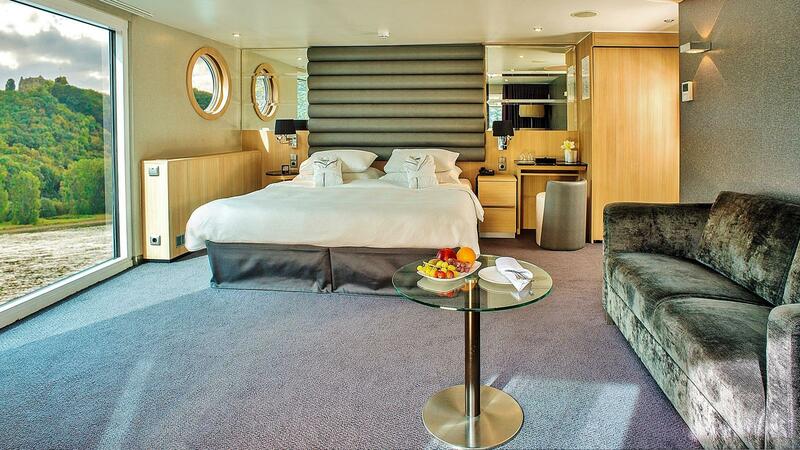 Immerse yourself in the luxurious staterooms aboard the Royal Emerald. 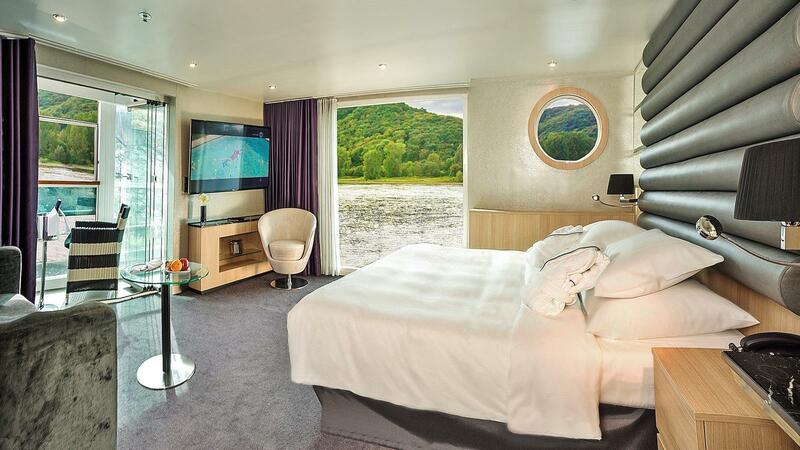 Each stateroom presents your own private sanctuary on the river and rivals any 5-star hotel with its contemporary design and delicious linens. 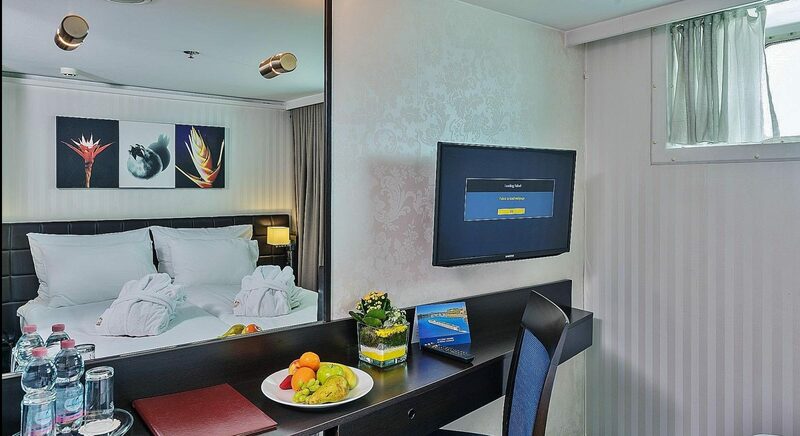 Sink into lusciousness and peaceful dreams after a full day of tailor-made exploring of the enchanting cities and ports. 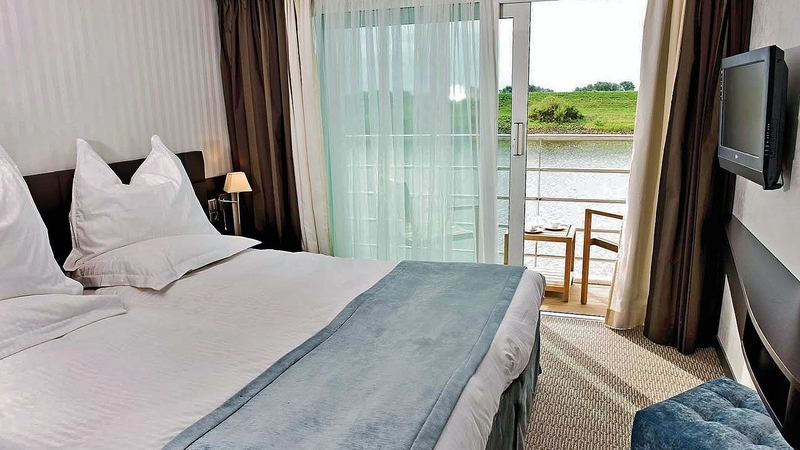 The Royal Emerald offers brilliant accommodations with spacious, airy suites, most with personal balconies and sweeping views of the riverside. 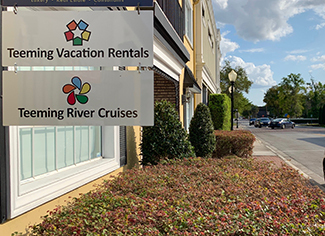 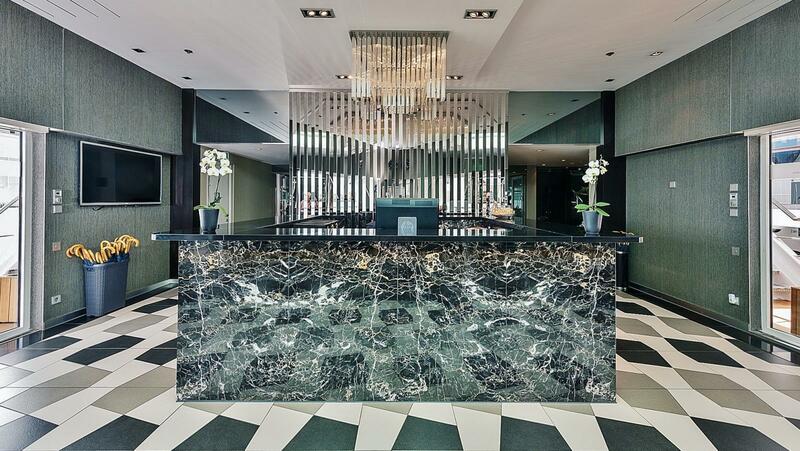 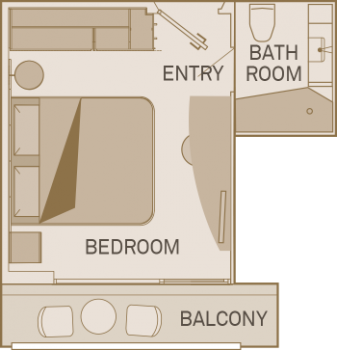 Additional comforts include flat-panel televisions, complimentary wireless internet access, safe deposit box, mini-bar, spacious built-in closets, and individual thermostat for air conditioning and heating control. 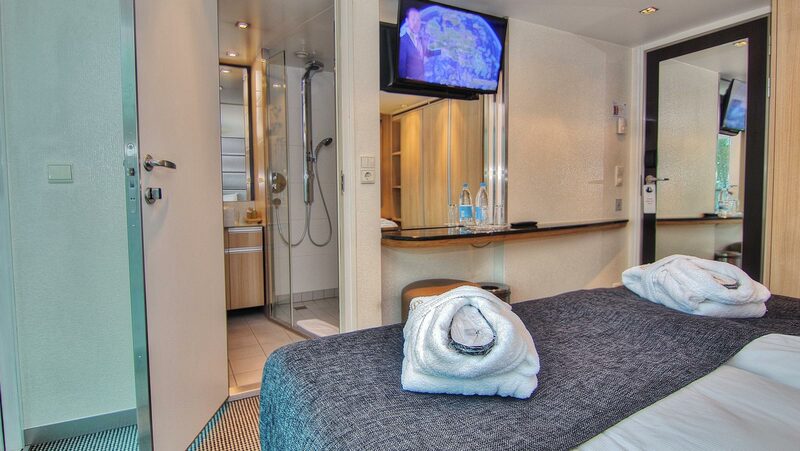 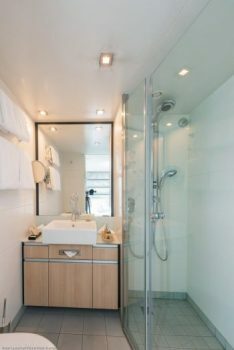 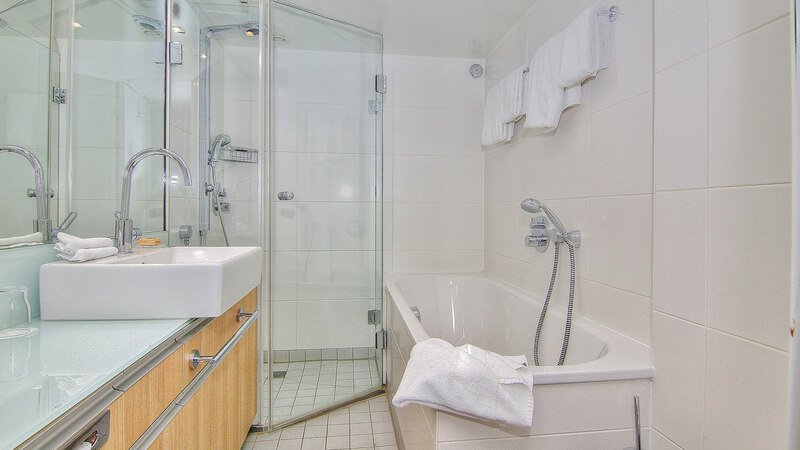 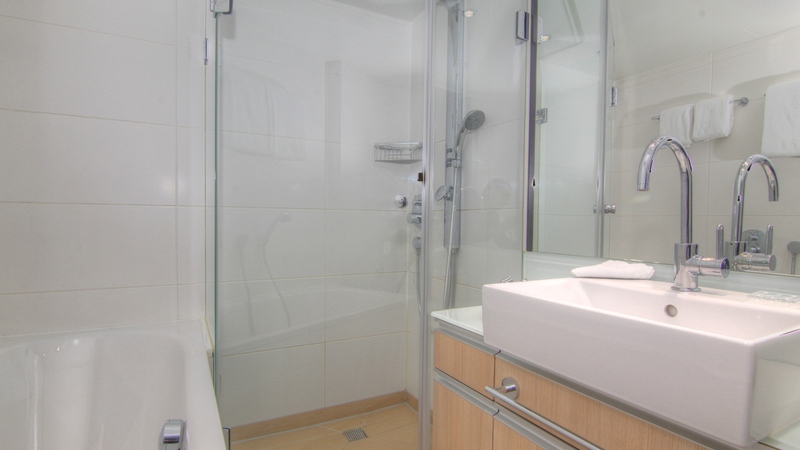 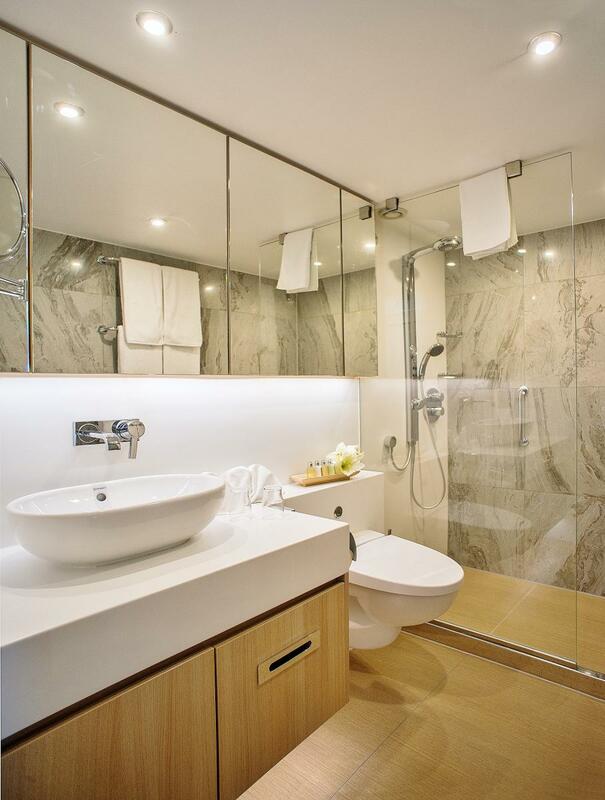 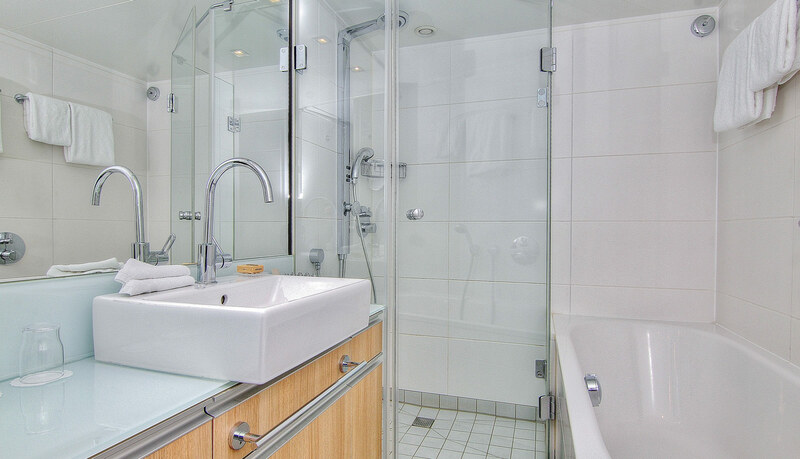 The perfectly appointed bathrooms are roomy by cruising standards and feature the very latest shower and wet-room technology and certain suites are even equipped with a bathtub! 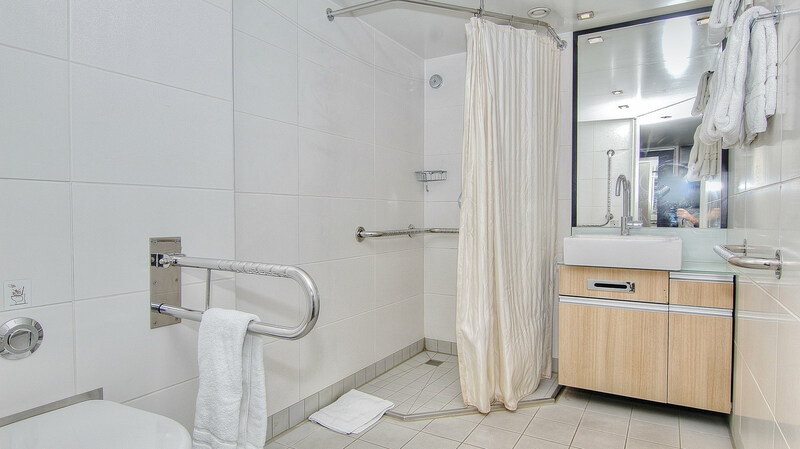 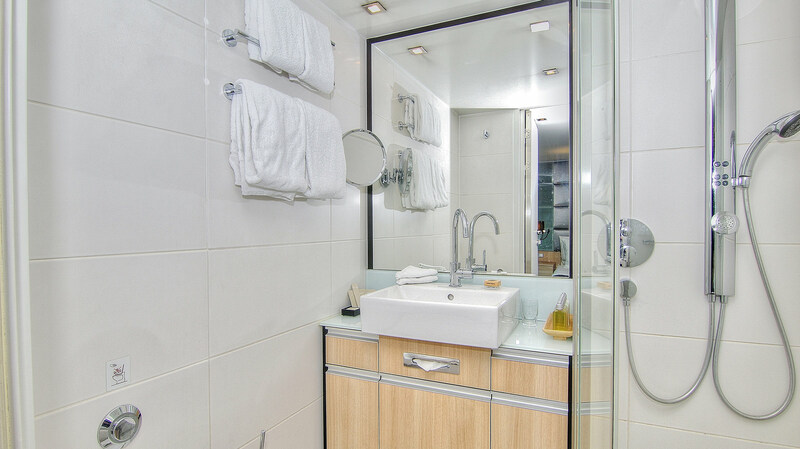 Our travelers are pampered with plush bathrobes, slippers, hairdryers, and spa bath and body products for convenience. 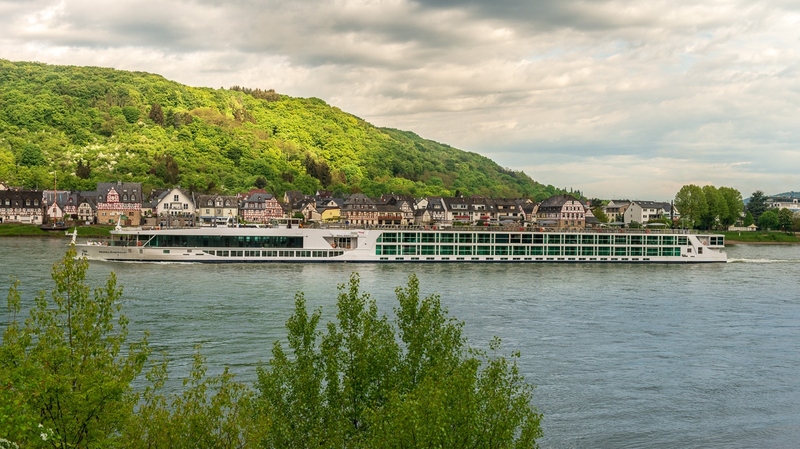 Your floating hotel will impress even the most discerning traveler and we welcome you aboard this precious gem, the Royal Emerald. 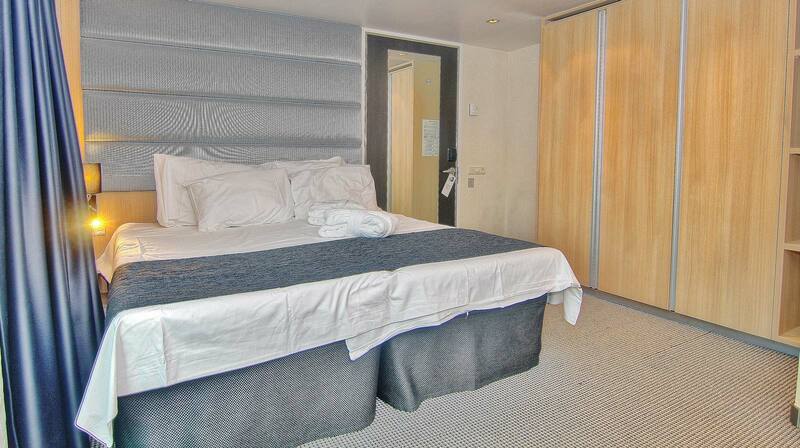 There are 84 suites on board. 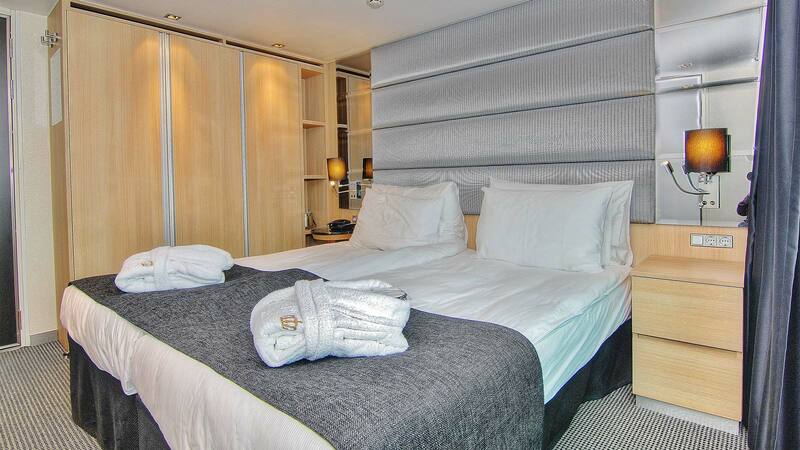 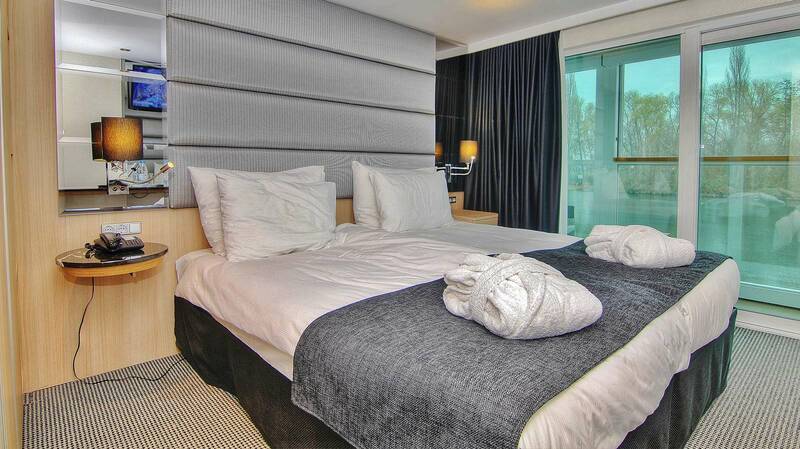 The beds can be configured as twins or doubles. 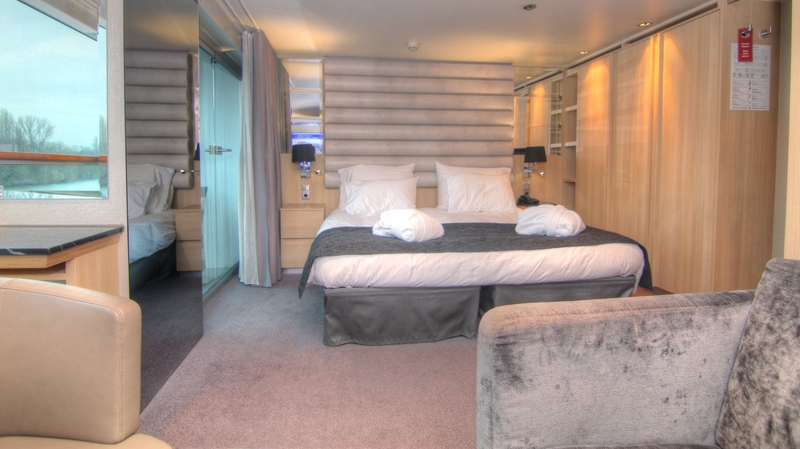 Suites (except for Standard Suites) feature private balconies fitted with the pioneering sun lounge screen (a glass-enclosed seating area, which can be transformed into a balcony at the push of a button). 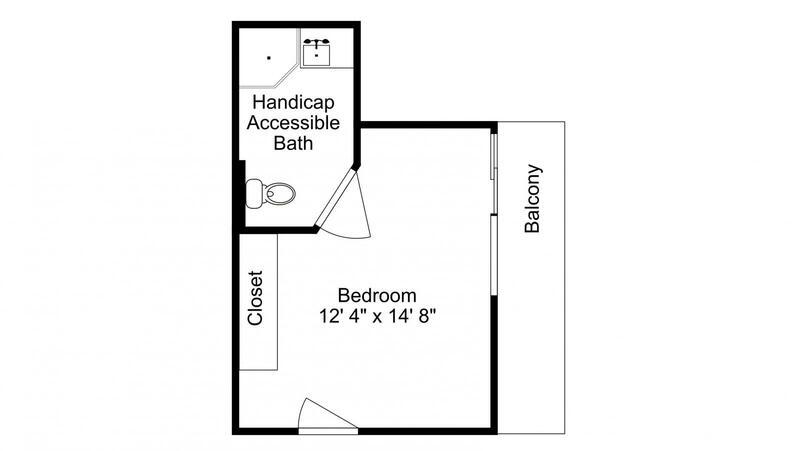 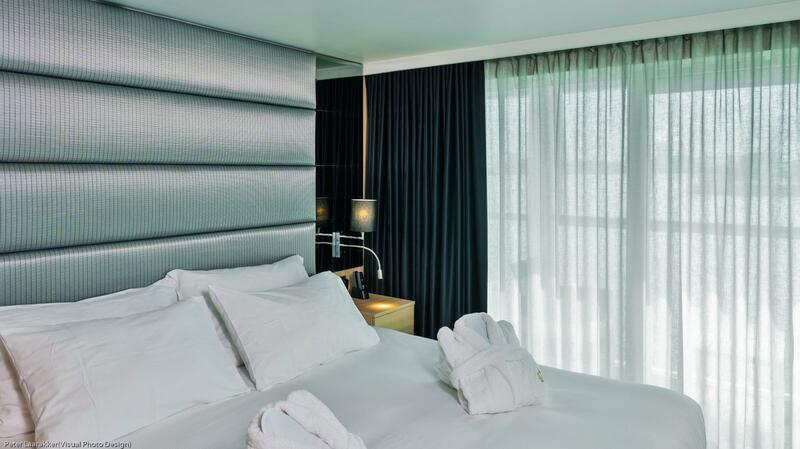 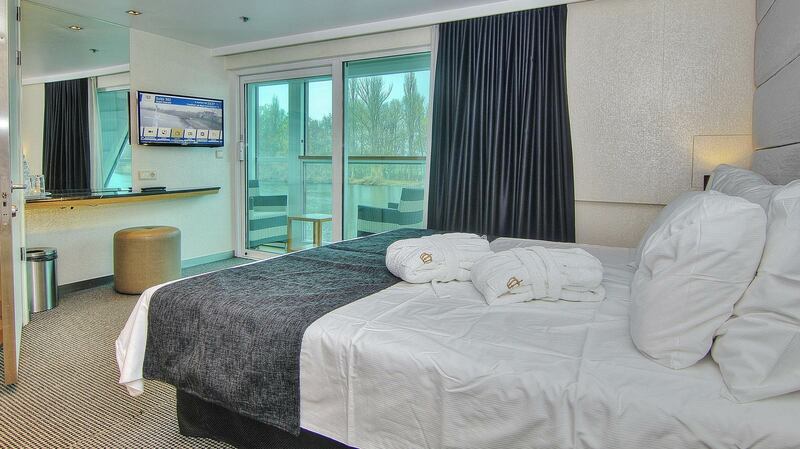 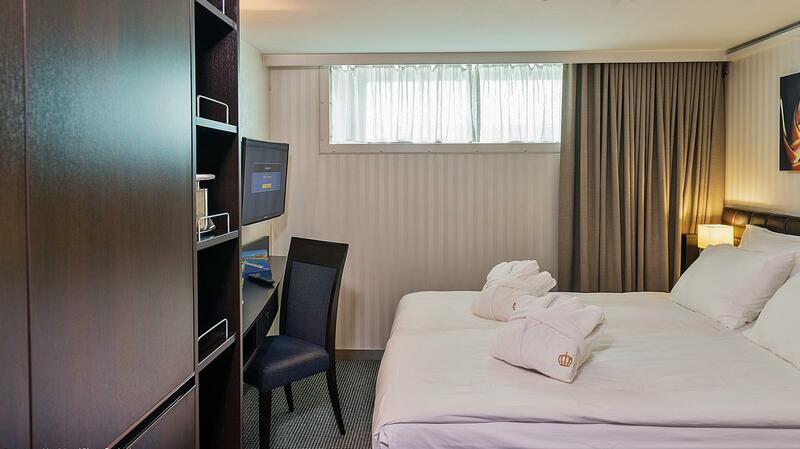 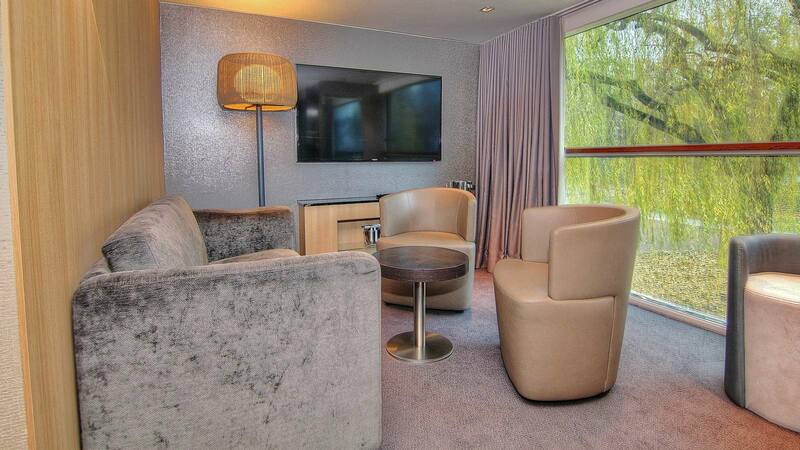 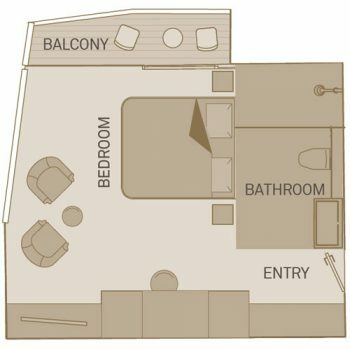 Standard Suites have elevated picture windows (no balcony) and more compact bathrooms. 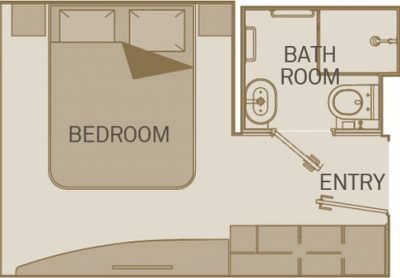 Closets vary in size by cabin category but have plentiful hangers, shelf and drawer space. 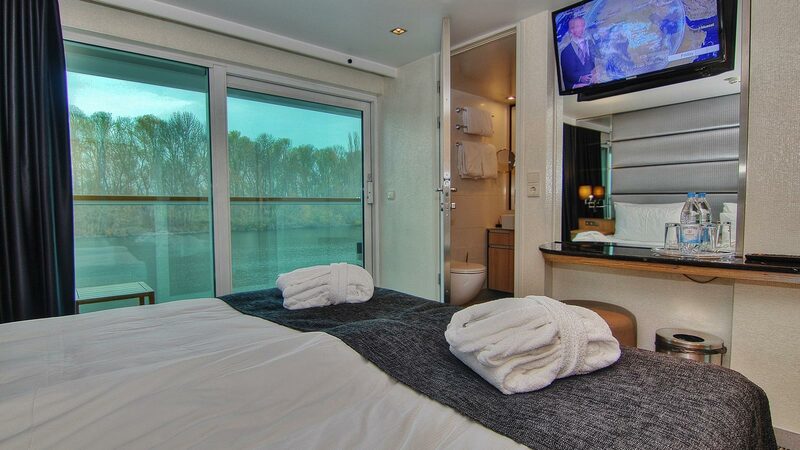 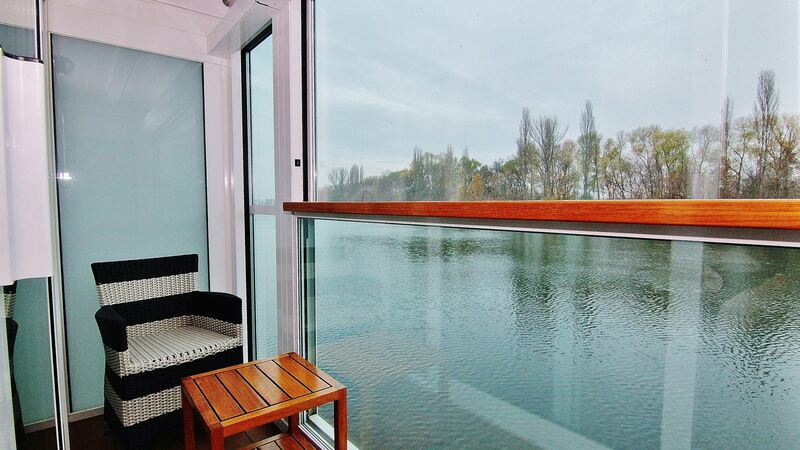 *Cabin 224 is a Single Occupancy Cabin (200 sq ft) and is priced as such. 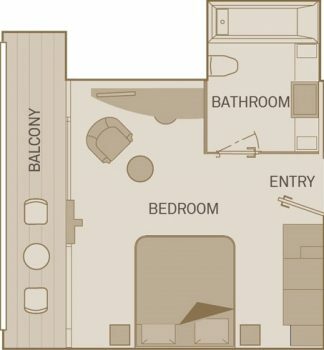 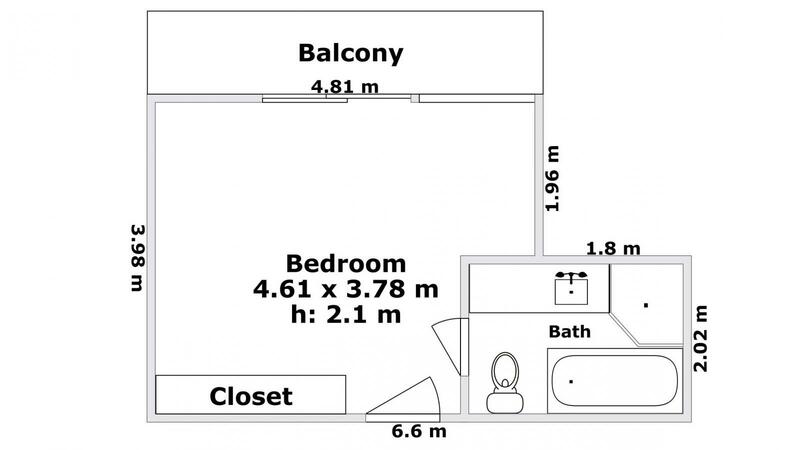 It is a full bed with a shower and balcony. 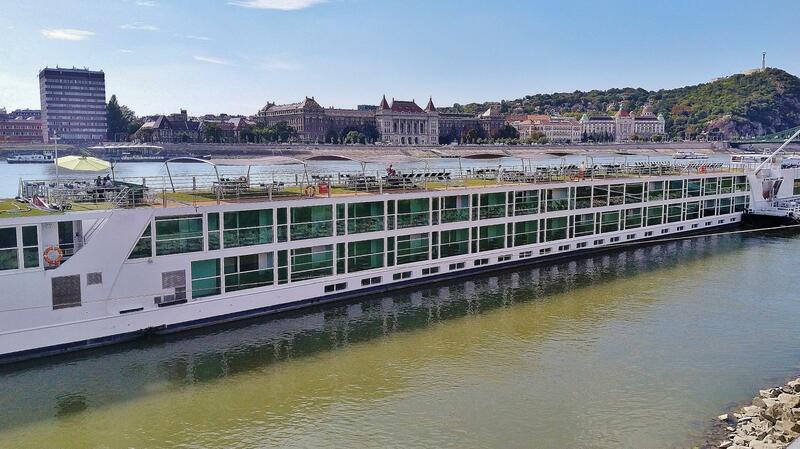 The Royal Emerald measures 443 feet in length and carries 171 guests and a crew of 42. 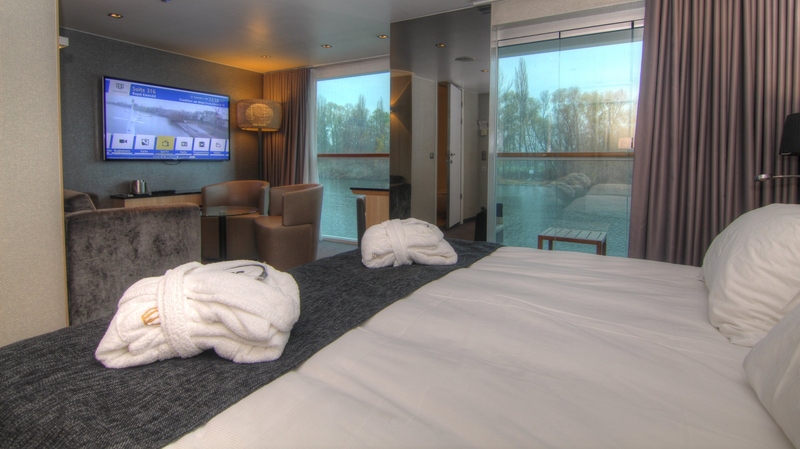 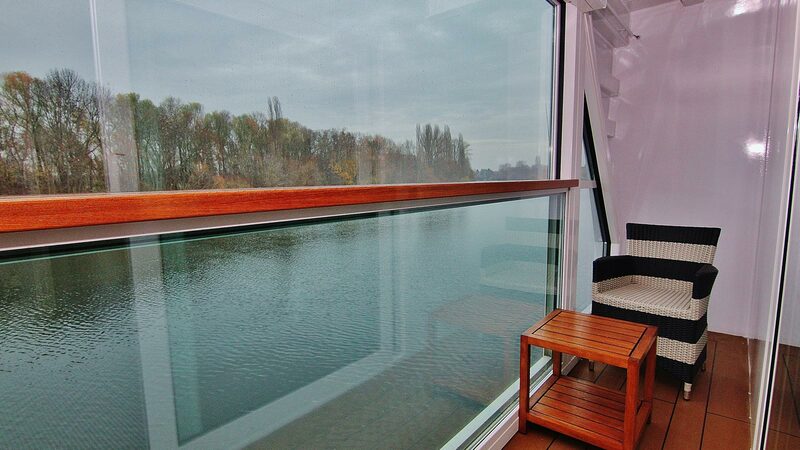 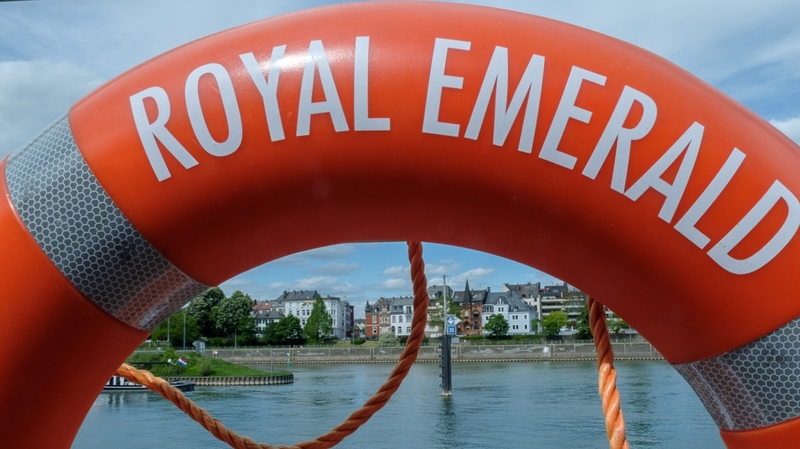 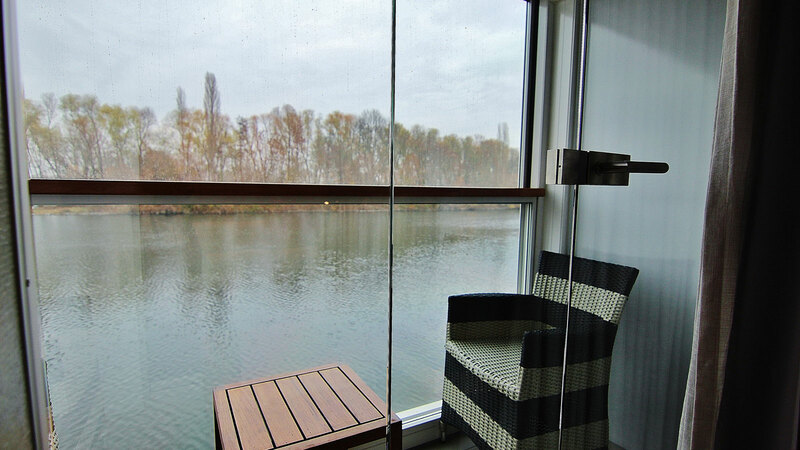 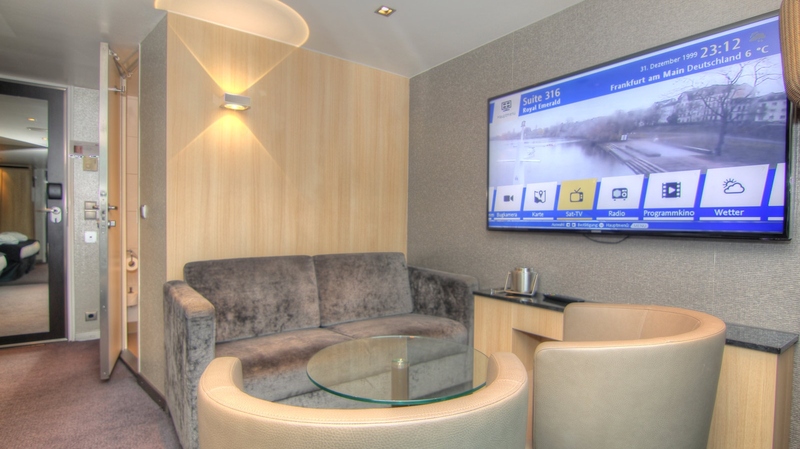 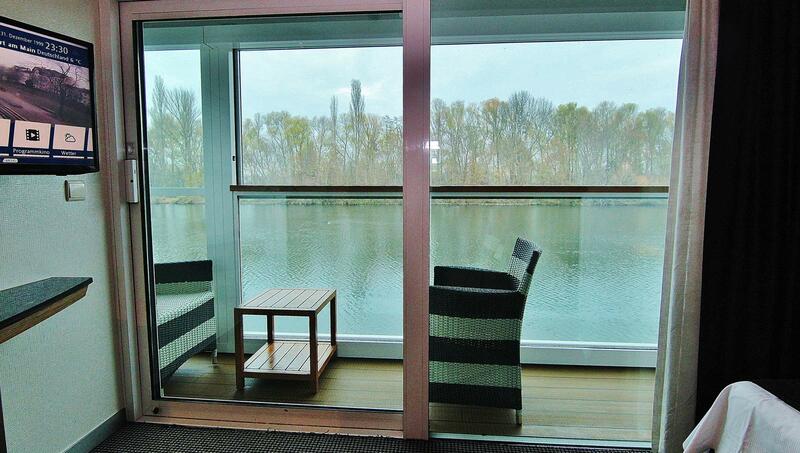 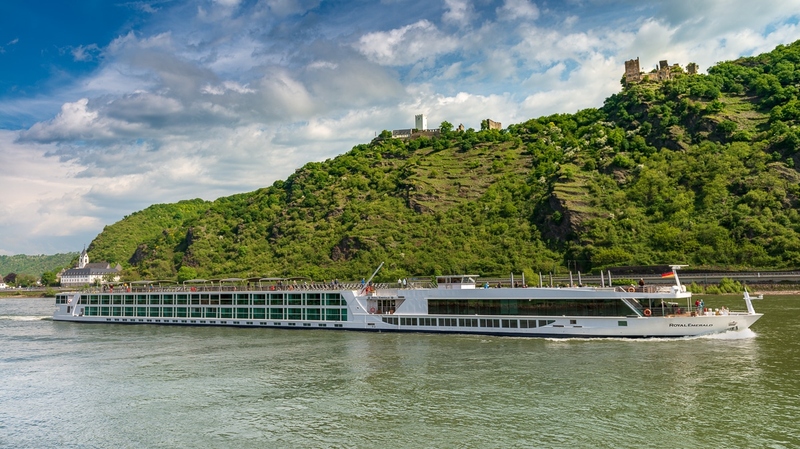 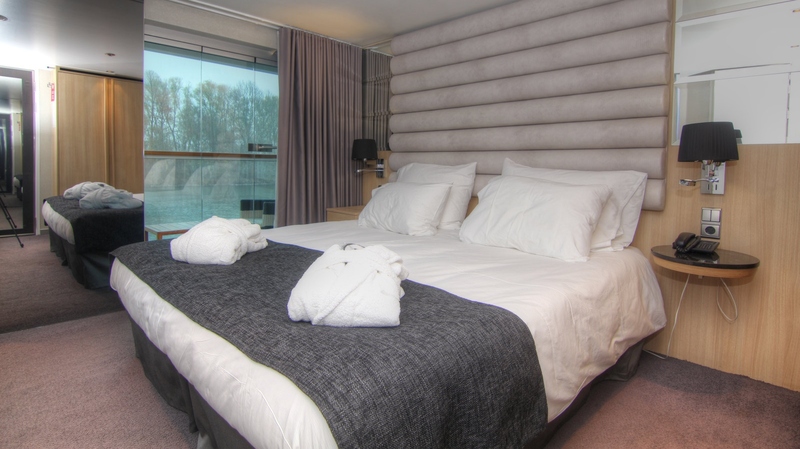 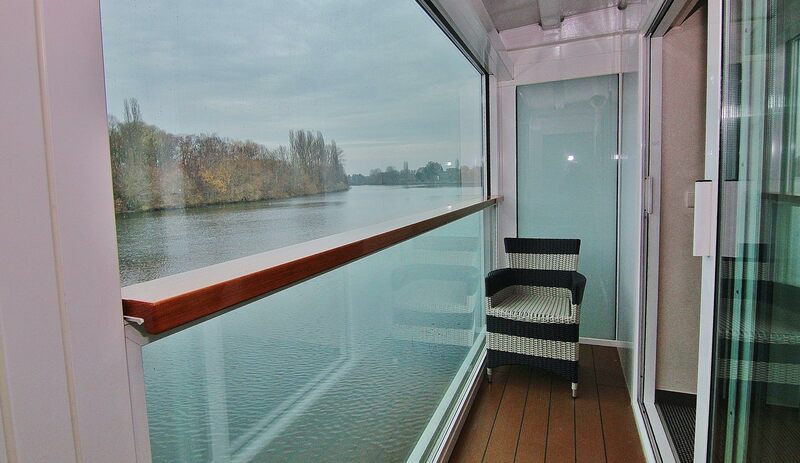 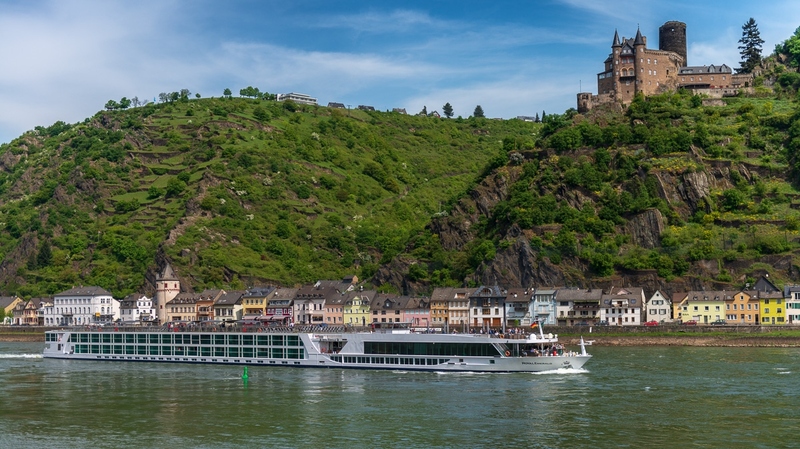 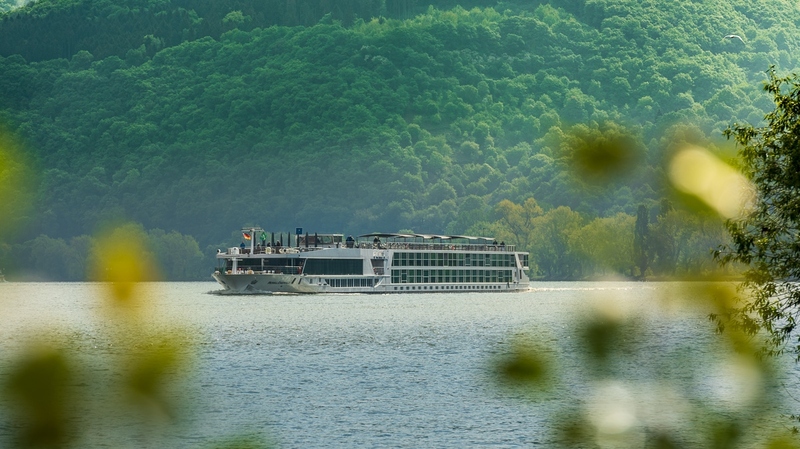 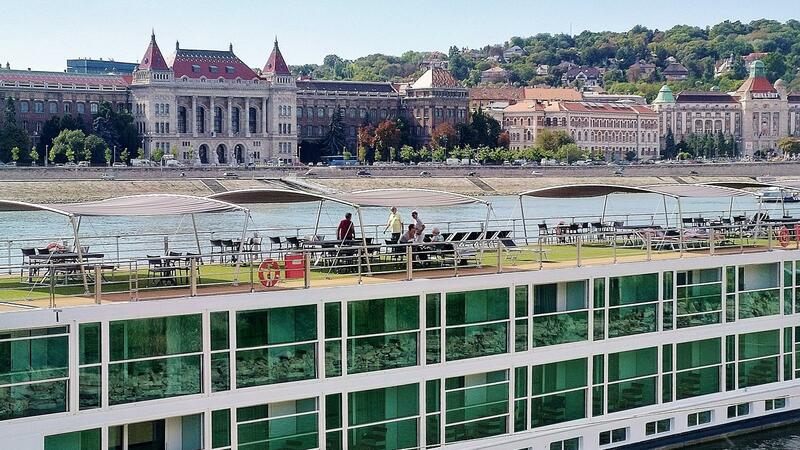 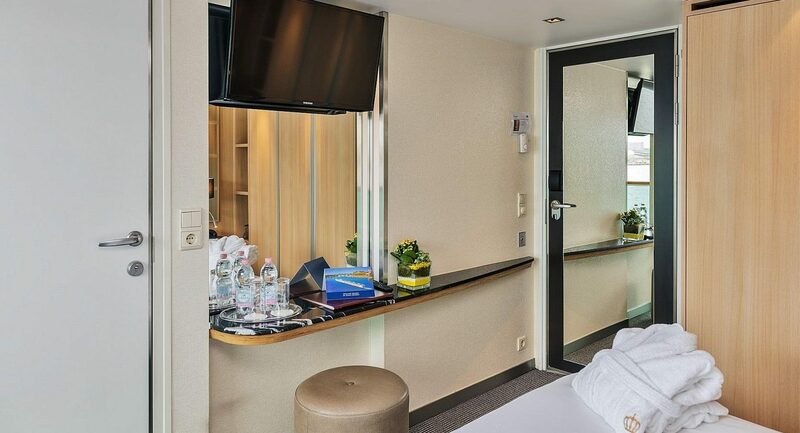 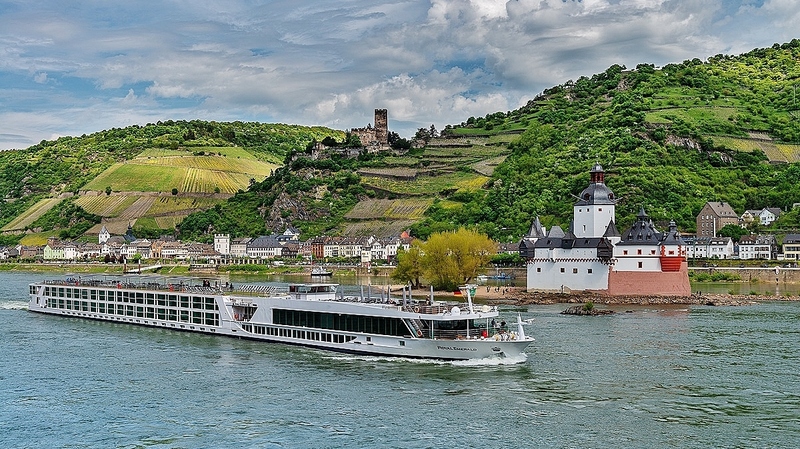 Unlike some river cruise ships, Royal Emerald offers full, step-out balconies for nearly all staterooms in place of more traditional French balcony staterooms. 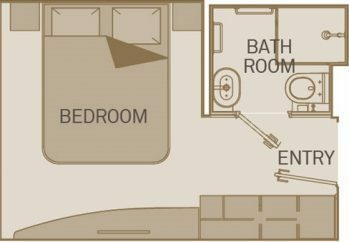 There are two main categories of staterooms: full balcony staterooms and standard Oceanview staterooms featuring a window that cannot open. 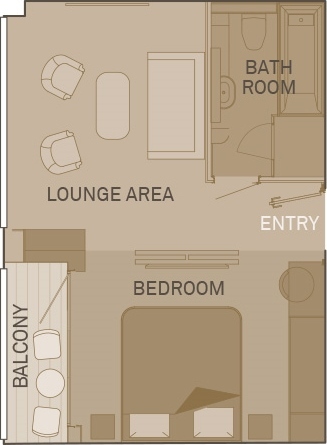 Categories are further differentiated by their relative position on the ship and their square footage. 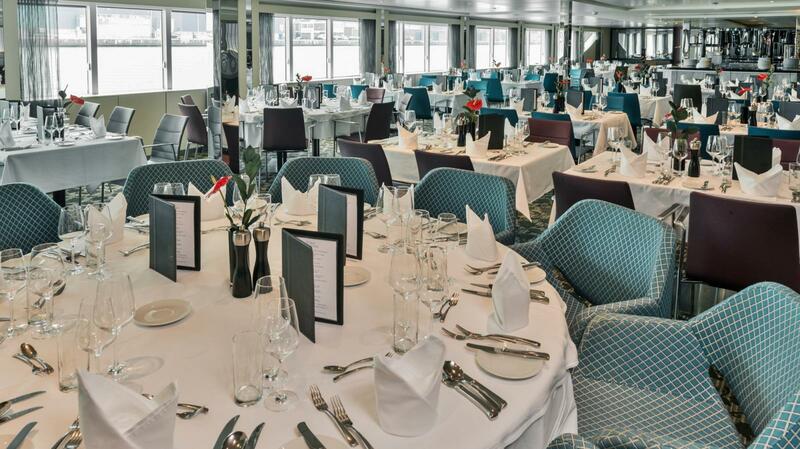 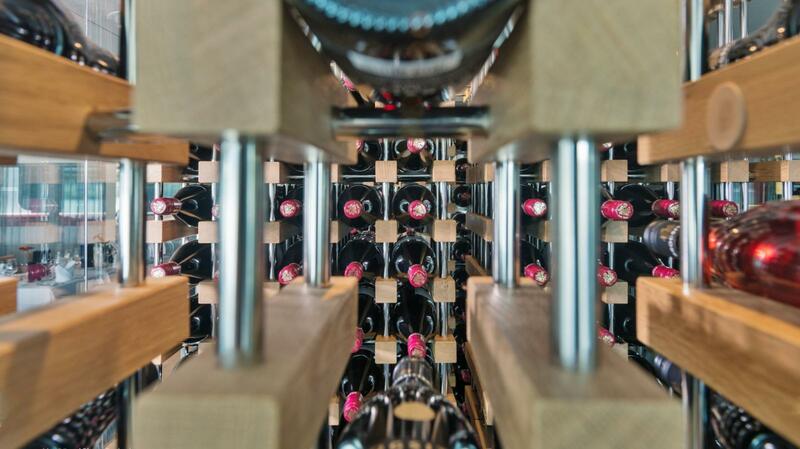 Spread over four decks, the onboard facilities include the Crystal Dining Room which is situated on the Sapphire Deck and serves delicious fare in a comfortable setting with open seating throughout. 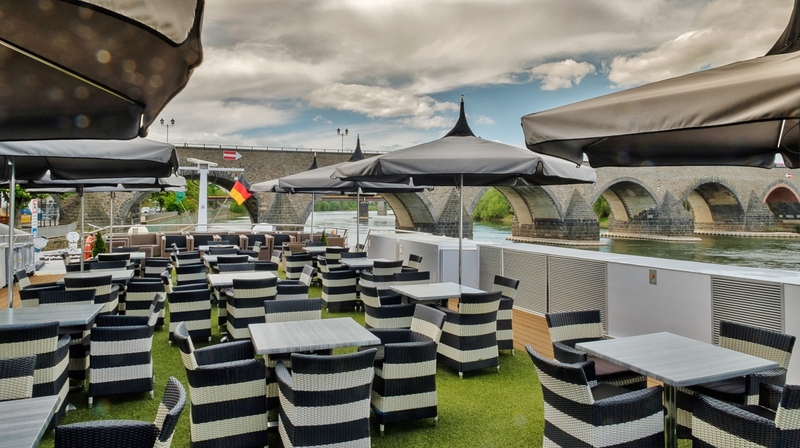 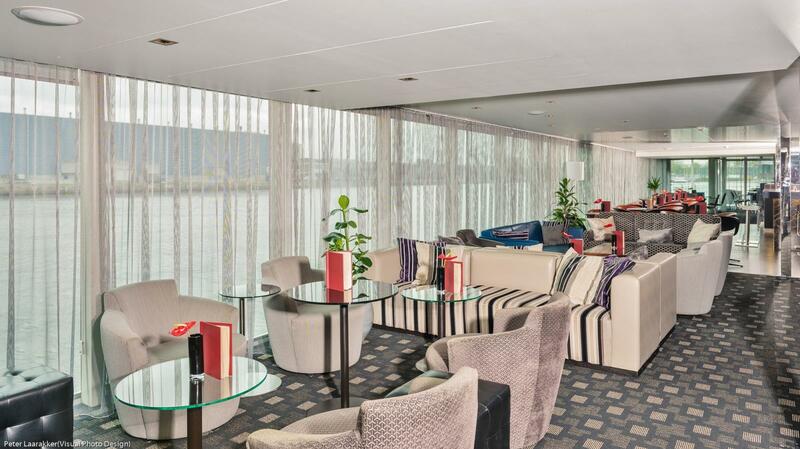 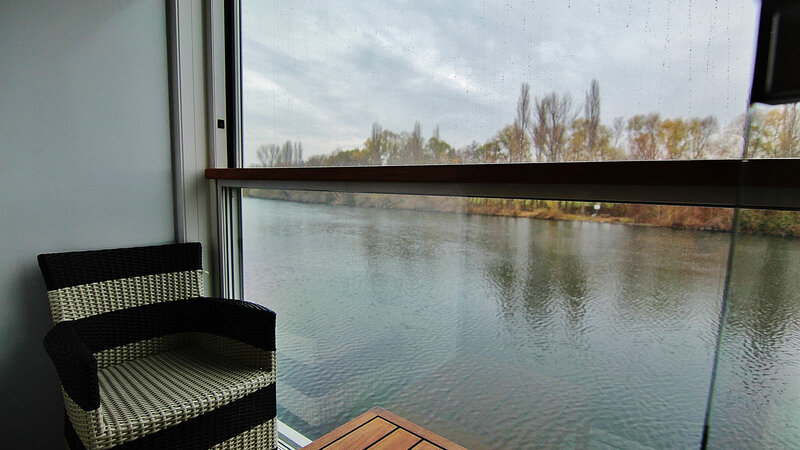 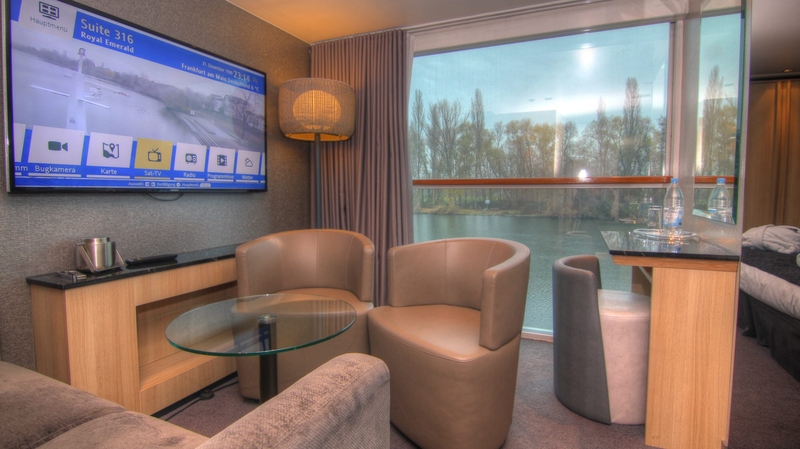 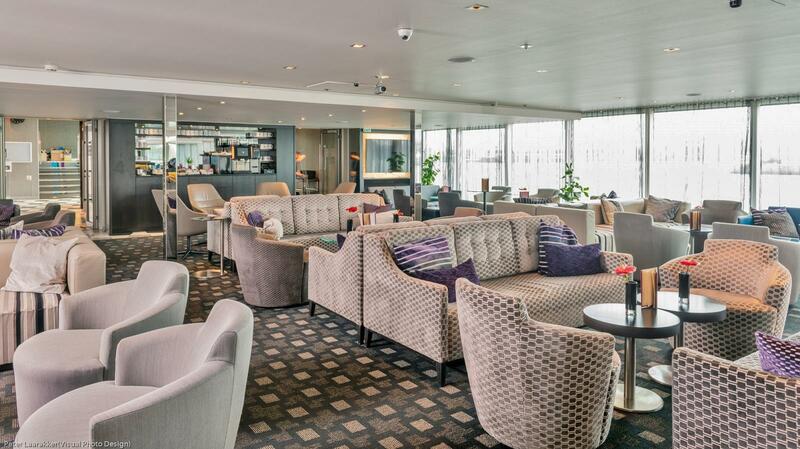 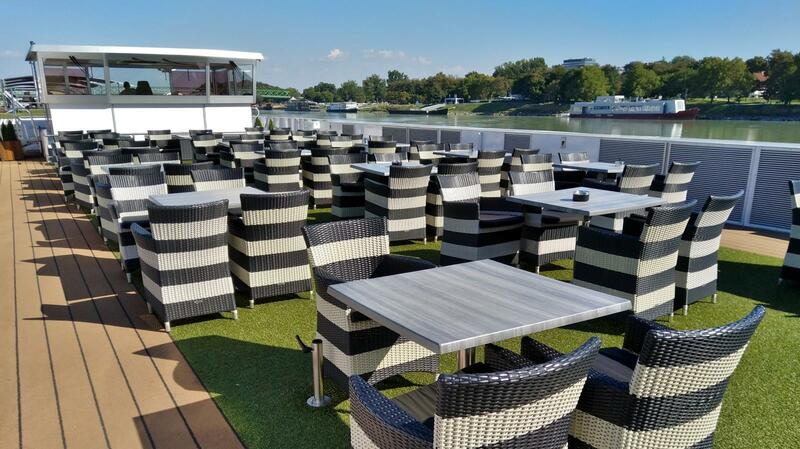 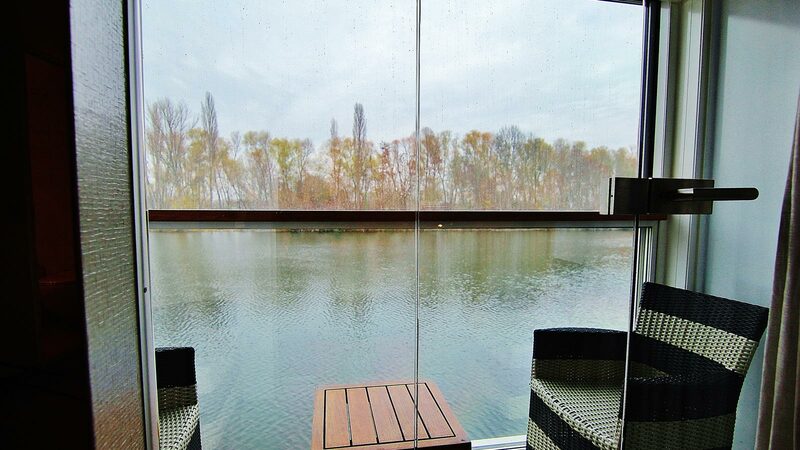 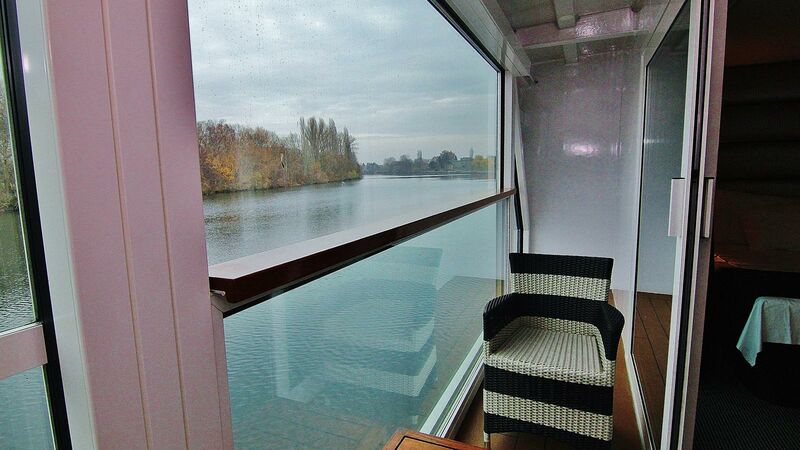 The Panorama Lounge & Bar is situated on the Diamond Deck and is a convivial social space with large floor-to-ceiling panoramic windows which create a bright and airy ambiance that allows for spectacular views of the passing scenery; a distinguishing feature of river cruising. 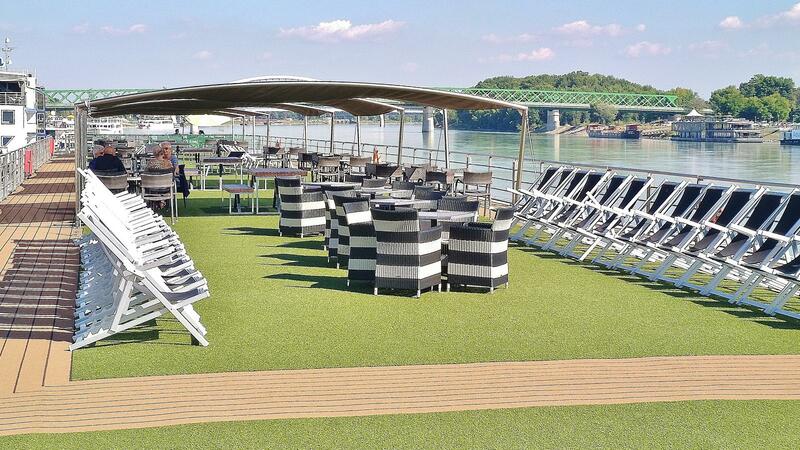 On the spacious Sun Deck, there is plenty of deck furniture where you can relax in the shade or enjoy the pleasant weather. 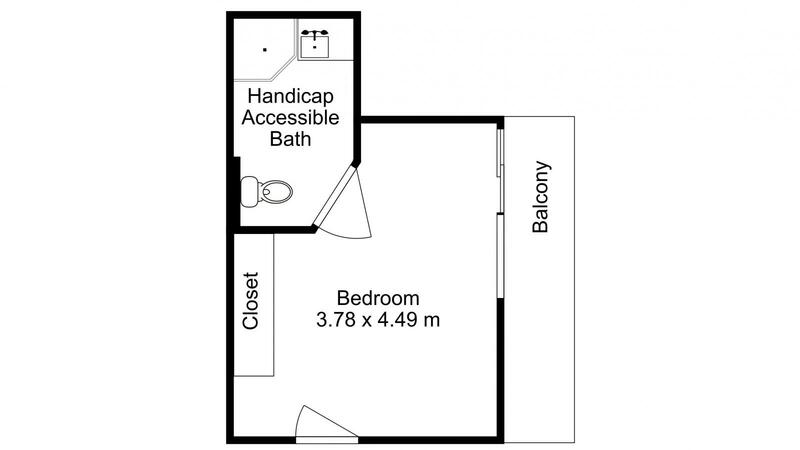 There is also a Walking Track for those who wish to keep fit. 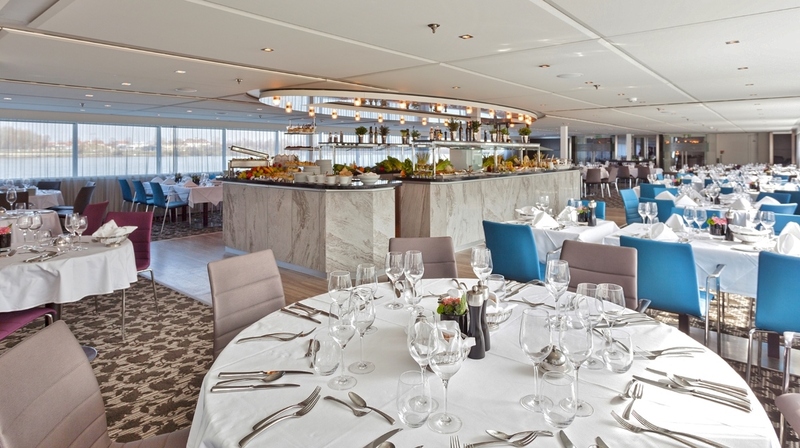 Meals are always taken in an open seating arrangement to allow you to meet and mingle with your fellow travelers. 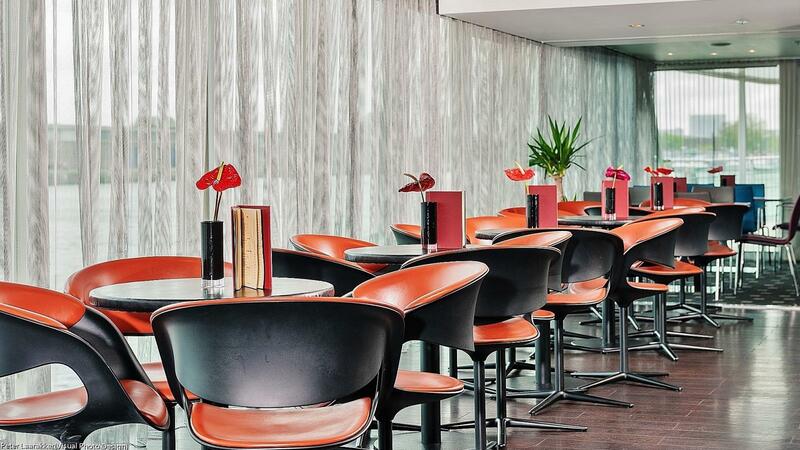 Breakfast and lunch are served buffet style and feature hot and cold dishes whereas dinner is served at your table. 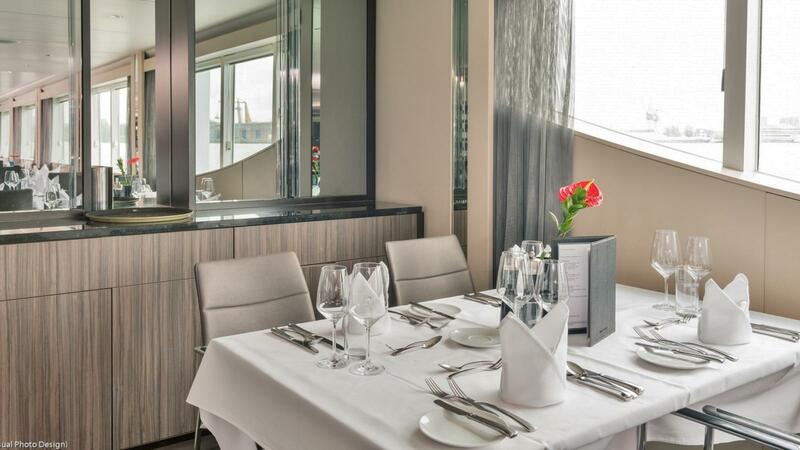 The cuisine is a selection of regional specialties and international dishes. 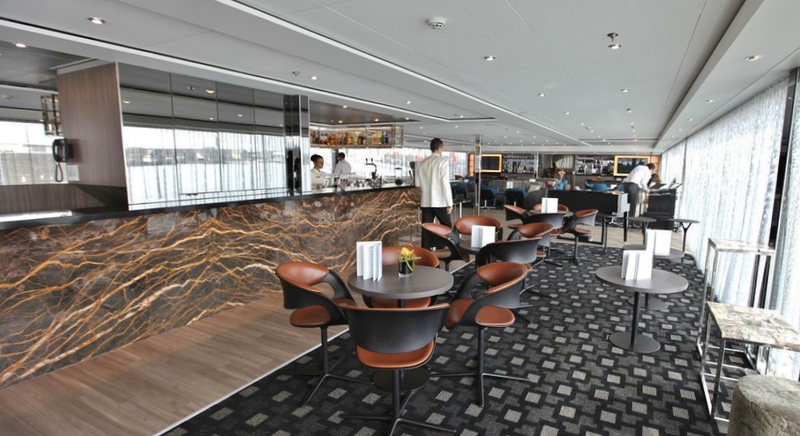 There is also a 24-hour tea & coffee station. 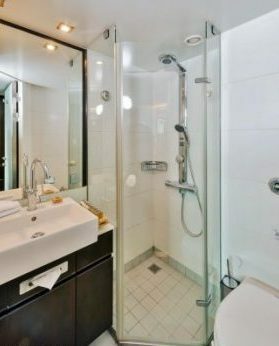 Tap water on board is filtered and suitable for drinking. 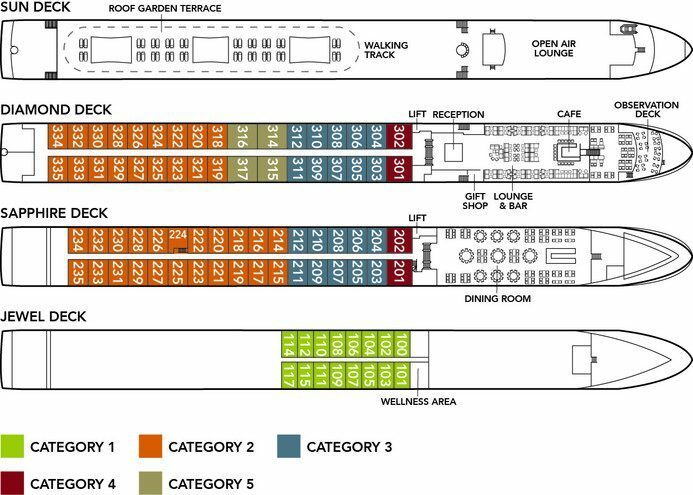 There is a lift for passenger use between Sapphire and Diamond Decks. 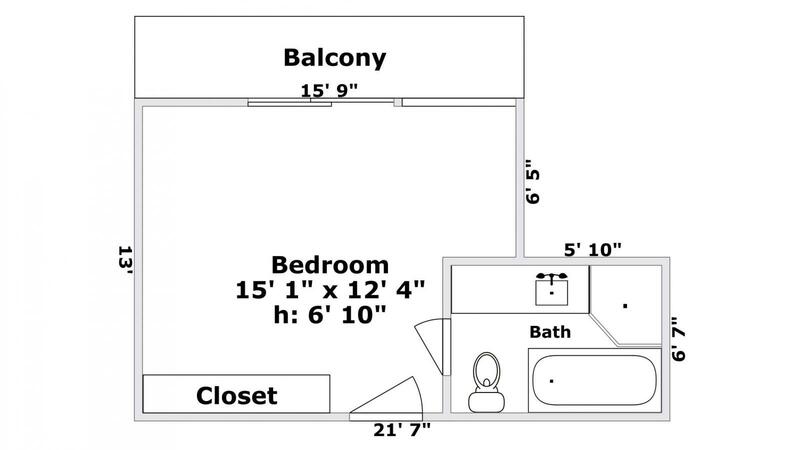 In order of appearance at top of page.